There are a few concepts that I tend to repeat often. 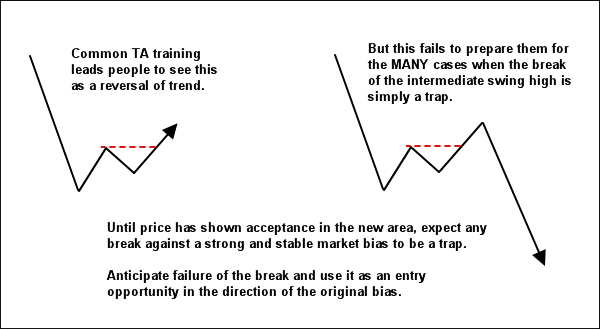 "Traps against market bias" is one of these concepts. Not just because they form a key part of my trading approach. But also because traps are difficult to trade for many traders. Psychologically, they can feel really uncomfortable. 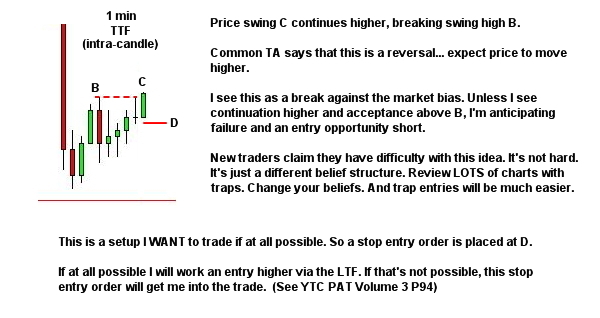 But in my opinion, when the context is right, these are setups that you should be taking. 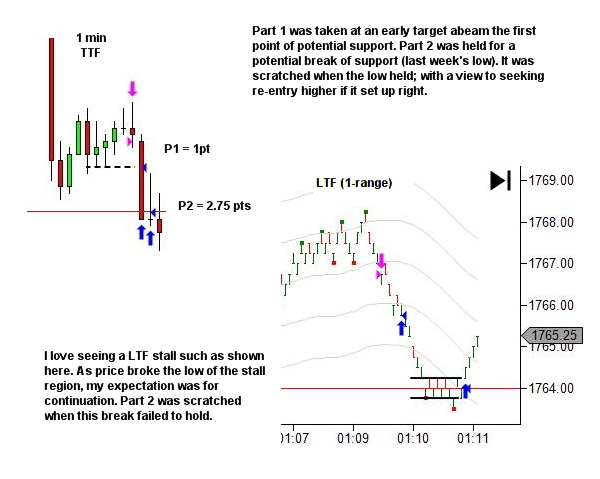 It's my hope that repetition will breed some familiarity and help you somewhat along the way to making them an integral part of your trading approach. 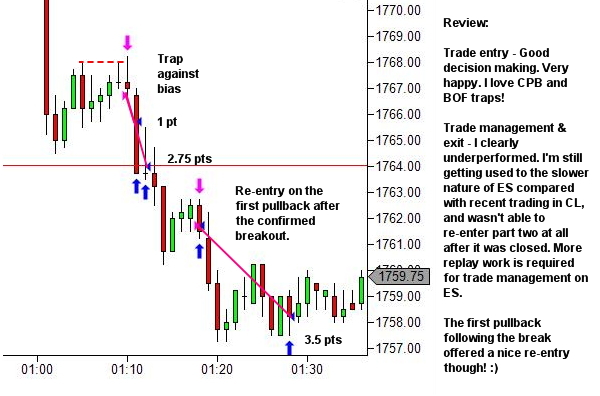 A common reason for difficulty in taking trap entries is your faulty expectations. Standard TA teaches us that a breakout of a key level or a significant swing high or low is a potential sign of a new trend. This leads to people expecting breaks to work. The reality is that it's only a potential sign of a new trend… at least up until price acceptance in the new area and signs of strength in this new direction. The reality is that breaks against bias often do fail. 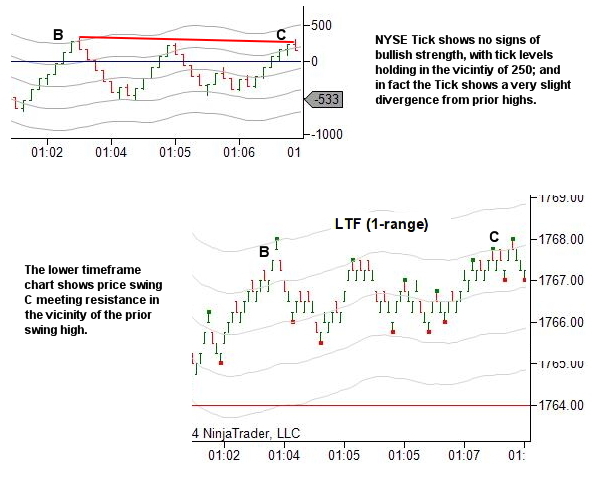 So, if you can gain an entry on a break against your bias, with acceptable reward:risk parameters, then this is a trade that you SHOULD be taking. So let's look at a market I haven't shown very often in the YTC newsletter. I'm currently experimenting with the emini S&P (chasing more liquidity… but that's another story)! 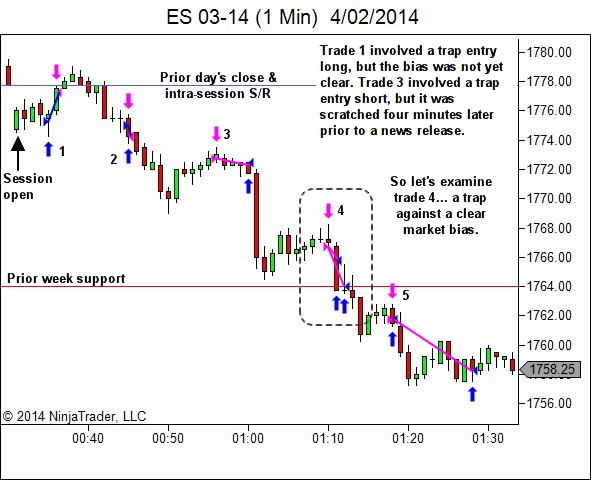 Let's look at Monday's very nice trending session and study a trap against market bias. Study your charts. Question your prior beliefs and consider amending them to something more useful – when a breakout occurs against a larger market bias, anticipate a failure. I had a question. The CPB shown, could that also be considered a 3 swing retracement or does it need a more defined S/L like the 1st peak of the CPB? Also did the candle breaking resistance before continuation form what could be seen as an up thrust trap? 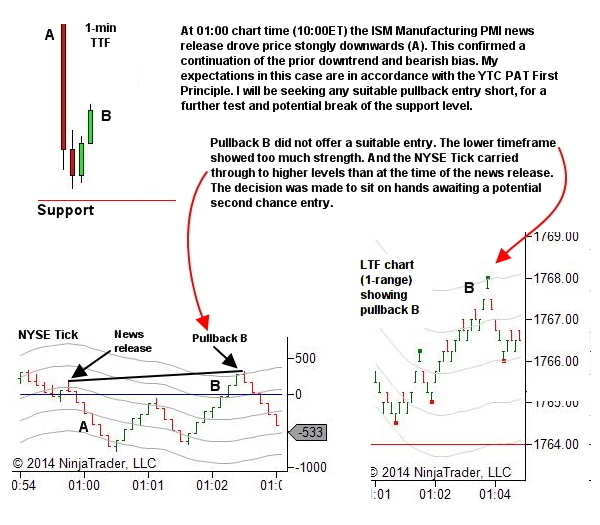 Yes, a 3-swing retrace is one type of CPB. In this case the CPB definitely is a 3 swing retracement. I wouldn’t call the final breaking candle an upthrust though. An upthrust requires a clearly defined and obvious ledge. I don’t think that’s the case here. Have you kept up with ES? It has the most liquidity but I’ve found it a difficult mkt due to the moves always coming back to my entries, no matter where I get in it backs n fills a lot – seems very restricted most times. Hi Goran, I try ES from time to time. I’m really keen to trade it because of the liquidity. But I always struggle to “feel” the flow of the market. The pace is slow and as you’ve noticed it’s just continual back and fill stuff with very little directional movement. My personality is just SO MUCH MORE suited to something that moves!